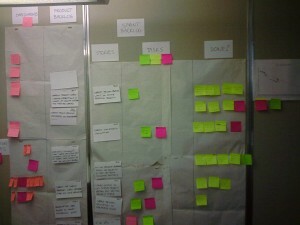 This was my first attempt at a usable scrum board. There are some flaws, like the blank story card in the Product Backlog?! (only noticed this now, no idea how that got there, will have to find out) and the fact that there’s a story that has no tasks assigned to it yet is not in the DONE area. I think it worked pretty effectively, especially the use of colored post-it’s to represent different “types” of tasks (tests, bugs, impediments etc.). I say this because I was able to pull in random people (business) and ask them if they understand what is going on here, and, with some basic explanation of the process, they understood perfectly. For me a true test of an “information radiator” is if a stranger can look at it and, given the basics, understands it reasonable well. Some things that I’d like to add include the teams definition of “DONE” and perhaps the three questions to encourage people to focus on the purpose of the daily scrums. Thoughts or ideas on improvement (or something I’m missing)? 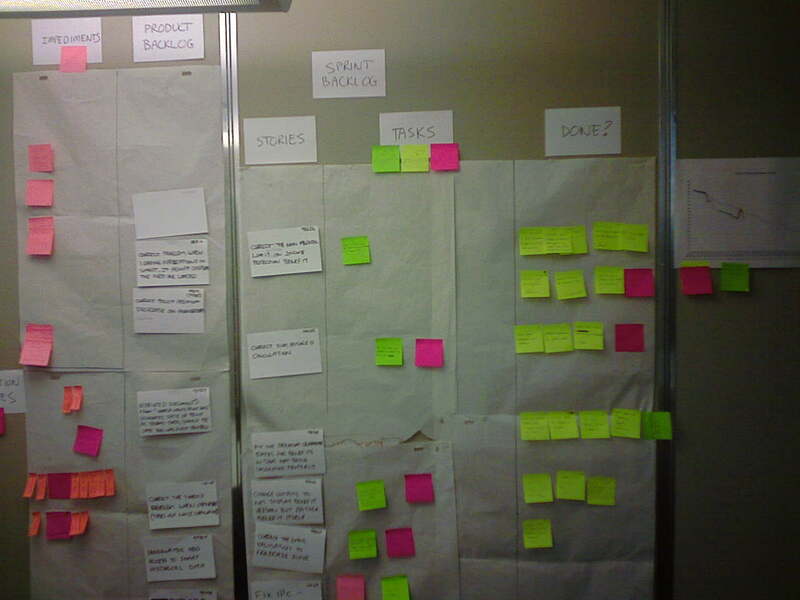 The bottom left stack of post-its are what we classified as “production issues” directly affecting business, which the team chose to tackle as they came in. The result was that it clearly shows we have a problem with existing systems (the sheer number of critical “issues” the team had to deal with).